Planet 3 in the Red Dwarf, Tappist-1 Aquarii System, 39.13 Light Years distant from Earth. Planet 1, and 2, can be seen as they transit across the red dwarf's disc. 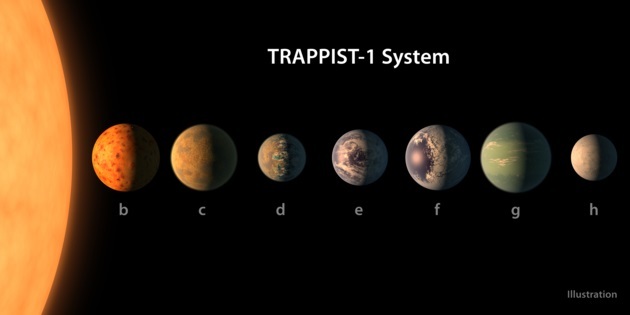 A team of University of Cambridge astronomers, using the ESO (European South Observatory) at La Silla in Chile have discovered, indirectly, what they call three 'Earth-like' planets orbiting a red dwarf star in the constellation of Aquarius. The star was given the name TAPPIST-1. 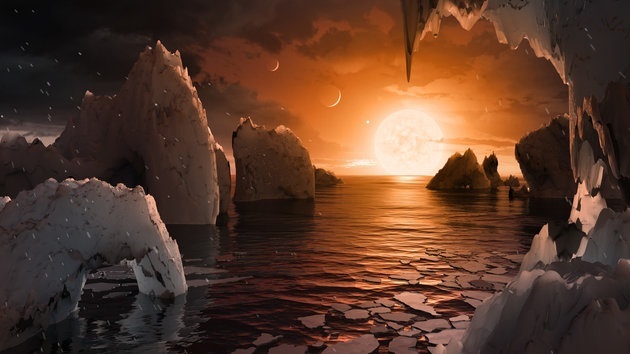 because this name was given to the telescope used in this undertaking, to underline the Belgian origin of the project to search for 'Earth-like' planets, in the vicinity of dwarf stars. The star Tappist-1 itself is just a little larger than Jupiter, and so gives out less heat and indeed light than our Sun. However these planets are near enough to the star that it is possible that water could exsist in liquid form (a requisite for life) in the twilight zone between the intensely hot day side facing the star and the frigid night hemisphere where the sun never rises, as these planets are likely to have a captured rotation and therefore rotate in the same period of time as it takes for each planet to orbit the star. (for all three planets, a matter of days!). The discovery that there are three such planets revolving about a red dwarf star opens up the possibility that there are many other numerous red dwarfs that could have planets. Because red Dwarfs are so small and emit less radiation, it may be possible to investigate these planets to see if they possess any atmosphere. So the search for earth-like planets continues. 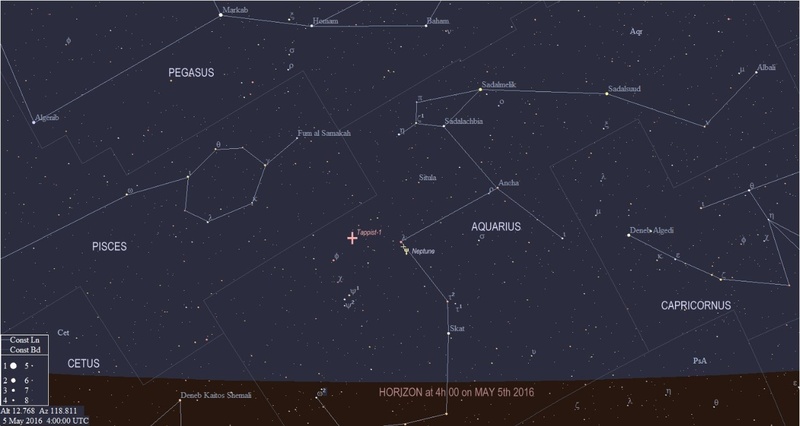 Star Chart indicating the position of the star Tappist-1 in the constellation of Aquarius, for interest's sake. Remember, this star is very faint and cannot be seen easily, even in most amateur astronomers' telescopes. 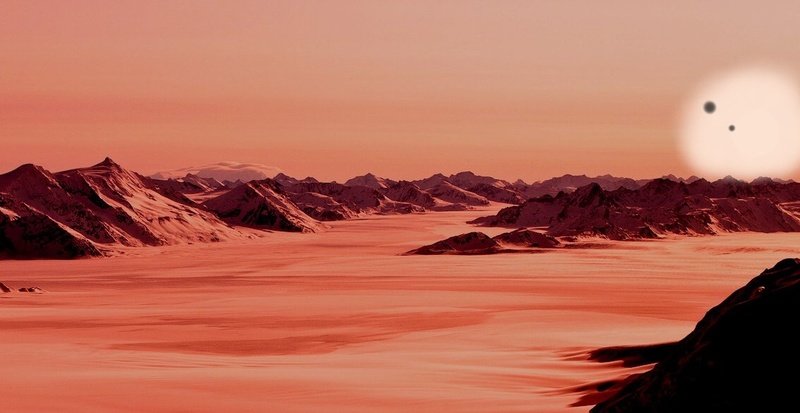 More planets, earth-like in nature have been discovered, 3 of which are at a distance from the Red Dwarf star where liquid water could exist on the surface. Planet Tappist-1f View towards its Sun with some of the other planets in the system.